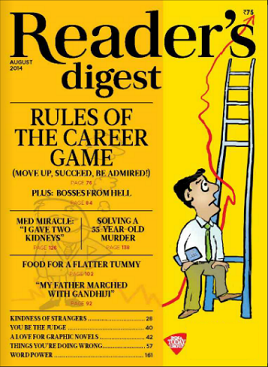 The November 2014 issue of Reader’s Digest India reached us quite on time, and here are our personal view and reviews for the same. The cover page uses basic colors this time, and it looks decent. The editorial of this month is interesting. A good line come from it is “knowledge is a shield and a weapon”. This month’s humor stuff is quite intelligent and not too funny. Kindness of the strangers – is one of our favourite segment in the magazine and we usually read it immediately after the editorial. This month was not exception. This time there are three real life incidents mentioned. A girl helped by a stranger while travelling in bus and experienced the odd – this incident may look a little ordinary but we find such people who help others while travelling and leaves an impact without showing off. The incident of a Chinese fellow is thrilling. We cannot imagine the relief they have felt when helped by some strangers in the night when he (a child then) and his mother were out of home and need to sleep on the road. The words “it takes very little to help someone in need, but the impact it has can be profound”. We agree with that. One more incident mentioned is about honesty. These fellows who went out of the way to help others, who are totally strangers to them, are the real heroes of the society. They make the society a better place to live in. You should not miss this small section to read. Hindu mythology is based on the qualities of each element or component we found in our surrounding. Tulsi – is respected as holy plant because of its herbal attributes; and that is why is part of almost all the rituals. The article about Tulsi – discusses its effects as a herb in interesting manner. Kailash Satyarthi and his efforts came to limelight when recently he was honoured with the Nobel prize for peace. A telephonic interview of him taken by Adam Smith is published in the issue and it is definitely worth reading. Mark Divine’s article about “taking leadership” comes under the hood of “Art of Living”. It is inspirational article. The first page of the article is impressive. He spoke my language – is a small tale exploring how the heart takes charge over the mind, when the actions of a loved one is referred. Sole Survivor – is the cover story of this issue. It talks about 3 survivors who cheat the death in different plane crashes. They may not have done anything heroic to survive, but their fate made them able to be the lone survivor(s). It is interesting to read and feel that there are times when truth really is stranger than the fiction. One more article of the issue which you should not miss reading is – new parts available. It is about artificial body parts. How the victim of odds (by birth, by accident or anything) can use them to live their life in better manner is the sole perspective we like about it. Though these parts are not cheap and comparatively hard to get, we hope that over the period of time it will be available easily and would be affordable to the majority of people in need. Minutes From Death – is a real life drama written in interesting manner. It is about survival instincts and fate both. If you like motivational writing, you can go for it. In – Travel – section this time there is an article about Copacabana. The placed is mentioned in several movies as well. There may be more photographs of the place added to the article. The article about Pop Francis is a good read. Dying for ivory – talks about the wrongdoings of people and suffering of elephants. One should read about such harsh realities to get aware of it and help the society to get rid of it. 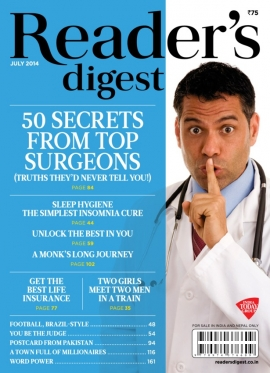 Overall a balanced issue which is worth reading.